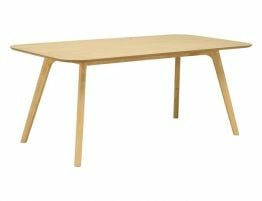 The Mila Dining Table Rectangle - Natural table is a beautiful example of the beauty of simple, elegant forms. Each of four legs have been cut on the diagonal and slant outward for equal weight distribution and striking form and balance. Steel bracing adds a decorative design detail and adds to the stability of the design. This design is modern, distinctive architectural form and structural clarity. 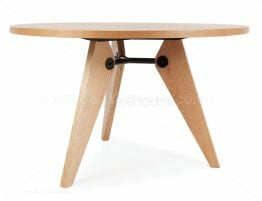 Natural toned Ash and simple metal fittings come together to create this Jean Prouve Gueridon reproduced designer dining table that is as home in your rustic kitchen as it is your contemporary dining room. 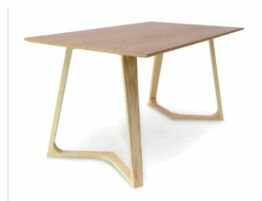 With dimensions of 130cm by 80cm, this table easily seats six people for your gatherings. The Mila Dining table looks superb when paired with many of the modern chairs in the Relaxhouse furniture dining chair range. 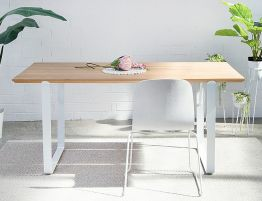 The Mila Dining Table, here in natural ash, is beautiful, sleek, contemporary and versatile. 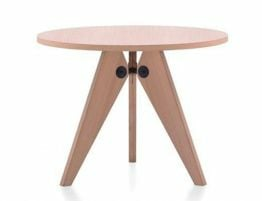 Our Mila dining table is available in both circle and rectangular forms and in natural and walnut finishes. 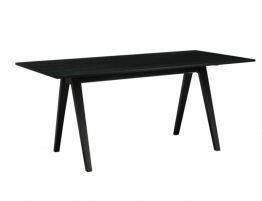 Our Mila Dining table works equally well for both the domestic setting and for commercial interior design like you café or restaurant. If you are contemplating a larger order, Relax House offers significant discounts to trade customers including Interior Designers, Hotels, Developers and more.